Over the past year, I've heard rumblings about the Scott Pilgrim movie over on AICN, but never caught on to the hype probably because I never read the source material. The trailer was released two weeks ago and with its video game-like appeal, I thought to myself, "ooh... this might actually be interesting". So I tackled the first three volumes in the series of six (of which five have been released) and can confidently say that I enjoyed them. 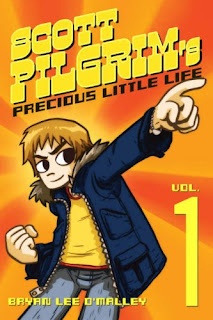 Scott Pilgrim is a series of manga-like comics with its story based in Toronto. The story follows Scott, who is unemployed, loves video games and plays in a band, while he finds his true love. There's a girl that constantly reappears in his dreams and he's convinced that she's "the one". One day he meets Ramona Flowers, who turns out to be the girl haunting his dreams, and they hit it off. If it seems too good to be true, then you'd be correct. Before she can officially be his girlfriend, he needs to defeat her seven evil ex-boyfriends. So far he's fought one ex-boyfriend in each volume (keeping in mind I've only read up to three) and with the series culminating with volume six, I don't know what's going to happen. I think a lot of the joy I get from reading this title is because it's based in Toronto. There are dozens and dozens of references to Toronto landmarks like Casa Loma, Pacific Mall, Lee's Palace and even Honest Ed's (which becomes an obstacle course for one of Scott's battles). If I weren't from Toronto, I don't know if I would have the same appreciation, but it's just so cool to see his drawings of even something like Lee's Palace in a comic and quite accurately depicted at that. As I mentioned earlier, I liked the video game-appeal of the story. Often times when you see Scott and his buds chilling, they'll be doing some form of gaming and talking about it in nerd speak. There's also RPG elements incorporated into it which is quite amusing. For example, after defeating each boyfriend, they drop coins and loot (he finds a 1up with his own face on it at one point). Certain items and gear that he comes across also give him a stat boost. Totally nerd-like, but cute. I think the series is aimed at the young college and university crowd, with Scott being 23 and the whole story centered around finding love. There's references to the movies and music scene that the young-20s would be into. The series is written by Bryan Lee O'Malley who is originally from Toronto. It's clear from these books that he loves the city and it makes me feel happy to be a Torontorian as well. There's something quite perfect with the upcoming Scott Pilgrim VS The World movie. The movie was filmed in Toronto starring Michael Cera, who is also from Toronto (well... okay, Brampton). I think Cera's gonna make an awesome Scott Pilgrim. The character in the books seems almost exactly like him, mannerisms and all. As well, the geek-friendly Edgar Wright directed the thing so I think we're in good hands (of Spaced, Shaun of the Dead and Hot Fuzz fame). 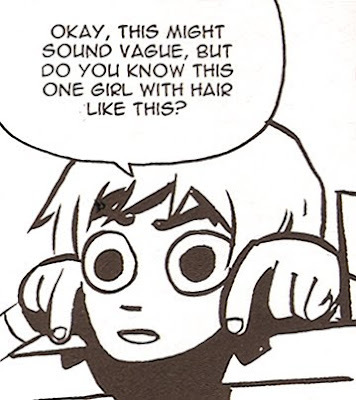 Scott Pilgrim is a fun read. It's nothing fulfilling or meaty like a DC crossover series, but it's just mindless fun, good for an afternoon read. If anything, check out the movie when it comes late this summer. Later geeks!